GE High Intensity Discharge (HID) lamps offer stable lumen and effective spectral output that is essential for supplemental greenhouse lighting. The Ecolux® HPS family of low-mercury lamps is TLCP compliant with long life and outstanding efficiency. The multivapor quartz MH lamps are highly efficient lamps that produce crisp white light and deliver exceptional long life. 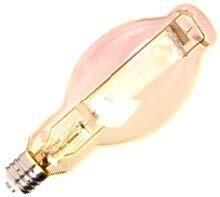 ITEM CODE DESCRIPTION WATTS SPECTRUM COLOR TEMP INITIAL LUMENS POSITION RATED HRS.